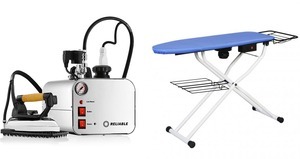 Note: We are pleased to announce that the Reliable 5000IS Ironing Station has been updated. The new model features a RESET button that protects the heating element and will prevent it from burning out and comes with an updated, modern stainless steel exterior. And of course our exclusive Lifetime boiler tank warranty. The new 5000IS replaces the old model shown in the picture on this page.. The Reliable™ 5000IS professional ironing system will make all of your ironing tasks easier. Professionals such as garment makers, dry cleaners, and tailors rely on the Reliable™ 550VB vacuum pressing table for superior pressing results. The 550VB vacuum pressing table is constructed from metal to ensure stability and durability even for heavy-duty professional work. The 5000IS is easy to use and to operate. Simply fill it up with regular tap water, plug it in, and in 10 minutes you will have beautiful dry steam.